Thomas Inman Councell was born on 8th November 1793 at Wrington. He was the son of William Councell and Elizabeth (nee Inman). He married Mary Gough on May 3rd 1814 in Bristol. Mary was the daughter of Thomas and Mary Gough. We are slightly confused by their children: we have a record of a Thomas Trueman Councell being born on 10th January 1816 and baptised at the Ebenezer Chapel, King Street, Bristol on 3rd February 1816, and a note a Thomas Inman Councell who was baptised in 1819. We are not sure whether this is the same person and the correct middle name is ‘Inman’. We also have a record of a baptism of a son, Charles George Councell on 14th March 1819 at the Ebenezer Chapel and another son, George was baptised in St Mary’s Church in Thornbury on 18th July 1822, but he was buried on 4th September of the same year. A daughter Mary Ann was baptised on 31st March 1820 at Ebenezer Chapel, King Street in Bristol. Another daughter, Hannah Matilda, was baptised there on 15th June 1821 and a third daughter, Sarah Inman Councell, baptised there on 16th February 1832. Their youngest son Edward Gough Councell appears to have been born in 1823. We do not know when the family actually moved to Thornbury. Thomas was in the Land Tax Records from 1819 as the occupier of premises owned by John Barton which appear to be the same premises in Thornbury High Street that he later owned. This property later became known as 27 High Street. On 28th December 1821 the trustees of the Free School in Castle Street agreed to rent the school house, school room and garden to Thomas Inman Councell “from Christmas last to the 25th day of March next” for £25. Initially Thomas’s business was in partnership with James Jennings of Bristol and they had shops in Thornbury and in Bristol. On 31st January 1825 the Hampshire Telegraph and Sussex Chronicle reported the fire in the Market in the High Street of Bristol which destroyed the grocer’s shop of Councell and Jennnings. The premises in Thornbury that was always known as ‘Councell’s’ traded for over a century. It is shown here above on the left a few doors down from what is now the Town Hall. 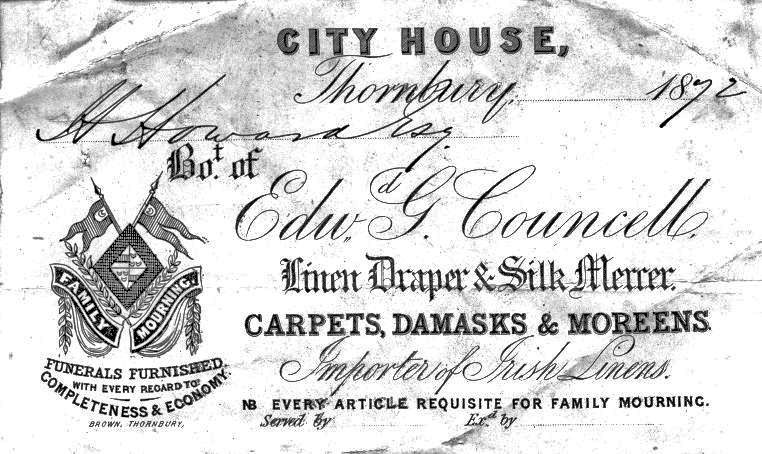 It seems that James Jennings and Thomas Inman Councell originally bought the premises in Thornbury High Street together, although from at least 1826 the Land Tax Records show that Thomas was the occupier and the owner. In 1828 Thomas Inman Councell bought James Jennings’ half share in the house and business in Thornbury for the sum of £300. However they continued to be partners in the business together with George Sawday of Thornbury. 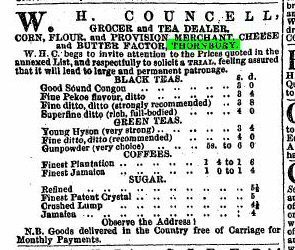 In Pigot’s Directory of 1830 Councell Jennings and Co were grocers and linen drapers in Thornbury and in Bristol. The Land Tax Records of 1827 and 1829 show that Thomas Inman Councell occupied a property owned by William Scott that is now 13 The Plain in Thornbury. We don’t know whether Thomas actually lived in the house as he is also shown in the Land Tax Records as owning and occupying his premises in the High Street. Thomas became Mayor of Thornbury in 1831. The partnership of Councell Jennings and Co was dissolved on 24th June 1835, according to a newspaper of the 27th of that month. The article says that the business was dissolved by “by effluxion of time.” Thomas assumed control of the Thornbury branch and James Jennings carried on with the Bristol business. The 1841 Census shows that Thomas Councell aged 48 was a grocer and draper living in the High Street. His wife Mary was also 48. They had four children; Mary Ann aged 21, Edward Gough Councell aged 18, William aged 16 and Sarah 12. Four assistants and two servants also lived in the household. Thomas and Mary appear to have had other children. Their grave in the churchyard of St Mary’s in Thornbury mentions Harriet Matilda, and Charles Gough Councell. Their daughter Sarah Louisa was buried on 1st May 1844 aged 15 years and six months. Thomas’s wife, Mary, died on 19th November 1844 aged 52. In August 1846 Thomas’s name appeared in the Bristol Mercury as an agent for the Bristol and Western Counties Building Society. Thomas Inman Councell junior. We have been contacted by a descendant of Thomas Inman Councell. She told us that Thomas had emigrated to Syracuse, New York State in the USA by 1840 when Thomas enlisted in the Army and served in the Florida War. The record of his enlistment in the army shows that he was a labourer aged 24. He was only just over 5ft. 3 inches in height and had blue eyes and a fair complexion. He was to serve in the “2nd Infantry K”. He was discharged in 1843 because of a disability and married soon afterward to Ann Wilson in Buffalo, New York State. Thomas and Ann had three children. In 1861 Thomas was living in Philadelphia when he enlisted in the US Army to fight in the Civil War. In 1862 he was discharged because of a disability caused by sunstroke and moved about 1865 to live in Cassapolis, Richland, Michigan. He never fully recovered his health. He spent the remainder of his life in Kalamazoo where he died in 1876. The two remaining sons, Edward Gough Councell and William Henry Councell remained in Thornbury where they took over the thriving grocer’s and draper’s businesses after their father’s death. Made of plate-glass zo high and broad and cleer. You will note that the poem refers to “E Councells” and “his brother’s.” When the Crown Inn next door closed about 1857 or 1858 the Councell brothers expanded their premises into the building next door and each became responsible for one of the the two different concerns; the grocery in the original building becoming William’s and the drapery in the former Crown Inn (later known as 25 High Street) becoming Edward’s. We have from this point treated the businesses run by Edward Gough Councell and William Henry Councell as separate concerns. Edward Gough Councell and his wife Mary Louisa. Edward Gough Councell married Mary Louisa Brown on 7th April 1846. She was the daughter of James Brown a farmer. The baptism records of Thornbury Methodist Church show that on 8th July 1849 the first son of Edward and Mary Louisa Councell was baptised Henry Edward. He was born on 9th June of that year. Edward and Mary Louisa had at least three more of their children baptised at the same Church; George Brown Councell on 4th April 1851 (born 19th December 1850), Mary Louise Councell on 20th August 1853 (born 16th December 1852) and Emily Culverwell Councell on 10th April 1859 (born 31st October 1858). On 26th December 1850 Edward Gough Councell bought a property which is now 4 Castle Street. Edward was Mayor of Thornbury in 1851. In the Census of that year Edward was a grocer and draper aged 27 with Mary his wife aged also 27. They had two sons Henry aged one and George aged three months. They also had three shop assistants living in the house; Francis Dixon aged 22, Frederick Cole aged 17 and Catherine Brown aged 18. They also had two servants; Eliza Williams aged 29 and Clara Hughes aged 20, their children’s nurse. In a newspaper of 7th January 1854 there appeared a notice that the partnership of Edward Gough Councell, William Henry Councell and Mary Ann Councell had been dissolved by mutual consent and all debts due to and owing by that company would be received and paid by Edward Gough Councell and William Henry Councell. The 1859 Rate Book shows that Edward and William each had their own shop, next door to each other. Edward was at the property which had been the Crown and was later known as 25 High Street. William was at 27 High Street. We know that both stores continued to trade in the High Street with William Henry selling groceries and Edward Gough selling drapery and clothing in adjoining premises. The 1861 Census shows that they lived in the High Street and that Edward was by this time 37. His wife Mary Louisa was also 37 and born in Devon. They had four children at this time, George aged ten, Mary aged eight, Edward Arthur aged five and Emily two. The household was a very large one; living in the same house was Mary Ann, Edward’s unmarried sister aged 40 and their shop assistants; Eliza Brown aged 18, Eliza Curwood aged 19, Matilda Morse aged 17, Edward Long 20 and Henry Chard 14. They also had two servants Sarah Walker aged 19 and Fanny Brown. In the 1871 Census it says that Edward’s wife, Mary Louisa then aged 47 was born in Somerset. Edward and his wife had Edward Arthur aged 15, Emily aged 12 and a niece Ellen Hannah Brown aged 30 from Devon and three other assistants and two servants. On 4th September 1873 Mary Louise Councell aged 20 daughter of Edward Gough Councell married George Ebenezer Brown of Torquay in St Mary’s Church in Thornbury. George’s father was James Brown. The Rate Book of 1876 shows that Edward Gough Councell owned the premises although number 25 High Street now seems to have been run by William Gates and Herbert Mullings. Presumably Edward and Mary Louisa went to live with their son in Liverpool about this time. Edward Gough Councell died in Grove Park, Liverpool on September 16 1878 aged 55 years. The 1881 Census shows Mary Louisa Councell his widow living with her son Edward Arthur Councell who was aged 25 and practising as a dentist near Mount Pleasant in Liverpool. Nellie Councell then 22 and unmarried is also living with them. When Edward Arthur married his mother seems to have moved out of the household. In 1891 Mary Louisa Councell was living in Toxteth in Liverpool with her daughter Emily Culverwell Brown Councell. The 1881 Census and 1885 Rate book show that Mullings continued to run the shop although the premises were owned by Mary Louisa Councell. By 1890 Francis Gayner had moved into the premises which he called City House. In his will dated dated 9th September 1872 Edward Gough Councell had devised the property to his widow, Mary Louisa Councell during her lifetime. On 22nd June 1898 Mary Louisa Councell of 19 Sydenham Avenue Liverpool widow and her late husband’s trustees, Edward Arthur Councell of 1 Sefton Drive Liverpool surgeon dentist and Emily Culverwell Councell of 19 Sydenham Avenue sold City House to Frances Gayner for £2000. Mary Louisa died 24th November 1900 aged 77 years. Her address at the time was ‘Thornbury’, Seabank Road, Liscard, Cheshire. William Henry Councell was the second surviving son of Thomas Inman Councell. He was born in 1825 in Thornbury. The 1851 Census shows that William H Councell aged 26 a grocer and draper was living in what is now Oriel House in Castle Street. He lived with his sister Mary Ann aged 29 who also worked as grocer and draper. We obtained the photo on the right from a family tree on the Ancestry website which said it was one of William Henry Councell. On 2nd August 1856 William Henry Councell bought a property in Silver Street from the trustees of Charles Gayner. This property was later known as 5 Silver Street. The property included a bakehouse adjoining the main building. On 24th March 1858 William Henry Councell married Ellen Hannah Brown at the Ebenezer Baptist Chapel in Newton Abbott. Ellen was the daughter of James Brown, a draper of Torquay. William and Ellen’s daughter Alice Mary Councell was born on 21st January 1859 and baptised in the Methodist Church in Thornbury on 10th April. Ellen Winifred was born on September 12th 1860. In the 1861 Census William H Councell was living next door to his brother Edward in Thornbury High Street. William was a grocer aged 34. He was living with his wife Ellen aged 27 who was born in Nether Stowey in Somerset and their children Alice aged two and Ellen aged six months. They also had two servants and three grocer’s assistants living with them. Richard Watson Councell, their first son was baptised on 16th June 1862 in the Methodist Church having been born on 25th December 1861. Amy Brown Councell was born 11th July 1864. Another daughter, Edith Caroline was baptised in the same Church, having been born on 19th June 1866. Their next son’s name seems to reflect their political leanings as his name was William Wilberforce Councell. He was born on 19th June 1867 at 7pm according to his birth certificate. His twin brother Henry Martyn was born at 8pm and baptised with him on 4th August 1867. 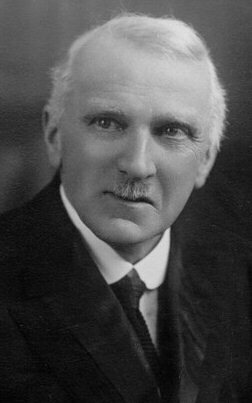 Charles Edward Councell was born 8th January 1869. Thomas James Councell was born on 21st March 1871 and we have a few lines about his later career below. An indenture dated 20th December 1865 shows that William bought the property known as Park House from Thomas Osborne Wetmore for £2200. In the 1871 Census William Henry Councell and his family were living across the road from his shop in Park House which just off the High Street. His shop was occupied by his shop assistant James Collings. Sadly William and Ellen lost a son Charles Edward Councell on 6th January 1882. He died of kidney disease at West Leigh in Belvoir Road, Bristol aged only 12 years. Cecil Wesley Councell was born on 18th October 1877 at Park House. We know that on 29th September 1879 Dr Edward Mills Grace bought Park House from W H Councell. Park House was one of the largest houses in Thornbury at that time and indicates that the Councell family owned a substantial amount of property in Thornbury. The 1876 Rate Book shows that in addition to Park House, W H Councell owned another house on the west side of the High Street (16 High Street) and a house and premises (presumably his shop) on the east side of the High Street, a house and court at 5 Silver Street and a house and court in Back Street and a stable and yard off Silver Street. The 1881 Census shows that the premises were occupied by Thomas Westcombe aged 29 from Oxford. Thomas was described as a grocer’s assistant. He was living with his wife Frances aged 25 who was born in Earthcott. In January 1882 when Charles Edward died aged 12, William was living at West Leigh, Belvoir Road, St Andrews, Bristol. He was also living here when he wrote his will in 1884. The 1885 Rate Book shows that William Henry Councell had become the owner of the property later known as 29 High Street and is the smaller of the two shops shown in the photograph on the left. This property had been owned by the Feoffees of the Grammar School and was incorporated into William’s shop at 27 High Street. William Henry Councell died at Marlborough House, Clevedon on May 19th 1887 aged 62 years. By his will of 5th February 1884 William Henry Councell then of Belvoir Road, St Andrews, Bristol empowered his trustees including his son, Richard Watson Councell, to sell his property. The income and profits were to be given to his wife, Ellen Hannah, during her lifetime and then to be shared equally between his children. By 1889 Councell and Westcombe were trading in the High Street in a property owned by the trustees of W H Councell. We do not know which member of the Councell family was involved in the business at that time. We know that the Westcombe in the partnership was Thomas Westcombe a grocer who on 7th January 1878 married Frances Savery daughter of Mark Savery the ironmonger. We do not know the connection, if any, between the Councell family and the Westcombes but the Savery family, like the Councells, were staunch Methodists. The museum in Thornbury still has vinegar jars with the name of Councell and Westcombe written on them. In 1891 Thomas Westcombe was still living in the shop in the High Street with his wife but he was now a grocer not a grocer’s assistant. Presumably this is confirmation that he had taken over the grocery business. We do not know how long the partnership of Councell and Westcombe continued. The 1901 Census shows that Godfrey Spyer had taken over as grocery manager. The Rate Books describe the premises as being owned by Councell and Sons throughout. In the Census of 1891 Ellen was a widow aged 58. She was living in Redland in Bristol with her sizeable family. Her daughter Ellen aged 30 was a music teacher. Amy aged 26 had no occupation. Edith aged 24 was a kindergarten teacher. William aged 23 was a clerk in a corn merchant’s office. Thomas was an articled pupil to a surveyor. Cecil aged 13 was still at school. There were two servants. In 1901 the Census shows that Ellen was still living in Bristol. She was a widow aged 67 living on her own means. Her son Thomas J. an architect aged 30 and daughters Alice aged 42, Ellen aged 40 and Amy aged 36 were still living with her. They had one servant. Ellen died on 9th October 1907. In the Rate Books of 1905 and 1910 the properties were still said to be owned by the Representatives of W H Councell. It is interesting to note that according to the Western Daily Press of April 21st 1916 when several tradesmen in High Street were named as failing to shade their lights at a time of national emergency it was William Wilberforce Councell and Henry Martin Councell who were summoned as owners of the shop. They continued trading under the name of Councell & Sons until 1946. On 16th January 1946 the property and the business was sold, initially to Frederick William Davies, a commercial clerk from Cooper Road, Westbury on Trym. On 31st January 1946 he sold it on to the Bristol Cooperative Society. Of William Henry’s children we know from his grandson that Thomas James Councell went to South Africa. In 1903 he married Margureta Harris at the Baptist Church in Port Elizabeth. Their son, Sydney, was born in 1905 and then the family returned to England. An advert in the South Gloucestershire Gazette of 26th August 1911 shows that he was the principal of the Thornbury and District School of Music. The advert said that the school of music was not only a teaching centre but an examination centre and that it was in the High Street. T James Councell (as he was described) said his qualifications were “Home Certificate and TC (London).” Presumably “TC” suggests that he was trained as teacher. We understand that Thomas became a minister of an apostolic faith in Bournemouth. In 1920 he traveled to Canada on the SS Majestic. Thomas separated from Margureta (who was known as Daisy) and she lived in Sidmouth in Devon. Thomas made other trips to Canada and the USA in 1923, 1924 and 1926. In 1933 he was killed in when a car hit him in Bournemouth. It was his birthday and he had just returned from a missionary trip to South Africa. Some of the Councell family appear to have continued their association with Thornbury. In 1921 Henry married Clarice Irene Longman in Thornbury. Clarice was born in Thornbury on 4th February 1903, the daughter of Henry Longman, a shoemaker and his wife, Ellen. Henry and Clarice had two children: Irene M born in 1923 and Ruth P. J. born in 1927. Henry Martyn Councell died on 21st November 1944 aged 77 and was buried in Thornbury Cemetery. There is a memorial stone on the internal wall of the Methodist Chapel in the High Street which indicates he kept up the family’s association with the chapel. Henry’s wife, Irene Clarice, married again on 6th September 1945. Her husband was William Stokes. Henry’s sister Edith was buried in Thornbury Cemetery on 27th May 1949. She had been living at 19 Rayleigh Road, Bristol and was aged 83. We believe it was Edith who was mentioned in the South Gloucestershire Chronicle of July 1916 as “Miss E Councell” who founded the Thornbury branch of the “Women’s Total Abstinence Union.” None of the three daughters married. Ellen Winifred died on 31st January 1919. Alice Mary died on 17th March 1925 and Amy Brown Councell died on 26th October 1939.